Garden trellis is ideal for all climbing plants, flowers and vegetables. These wooden garden trellises have durable stained timber with rust proof aluminium rivets for long life. This rose trellis is easy to use and erect as wall trellis. Made from sturdy 8mm thick sections with a mesh size of 5.5 inches. Available in tan and green. Look at other garden trellis in our range, wooden trellis, metal trellis and willow trellis panels. Heavy duty trellis fencing is ideal for all climbing plants, flowers and privacy trellis. Wooden garden flower trellis has durable stained timber with rust proof aluminium rivets for long life. Easy to use and erect as wall trellis. Made from sturdy 18mm x 8mm thick sections with a mesh size of 5.5 inches. These trellis fencing are available in tan and green. Look at other garden trellis in our range, wooden trellis, metal trellis, climbing trellis and willow trellis panels. Heavy Duty Expandable Riveted Trellis Fence. These natural bamboo gardening trellis are ideal for all climbing plants. Suits all gardens, ideal for wall trellis and privacy trellis. Excellent quality bamboo cane trellis. Please look at other trellis in our range, willow trellis, trellis panels, wooden trellis and metal trellis. Expandable willow trellis ideal for all climbing plants. Use as wall trellis in all gardens and as privacy trellis. Easy to use gardening trellis made from natural willow. 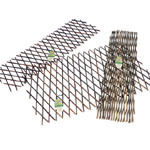 These trellis fences are Ideal for long stemmed plants and climbing plants. Can be used as a planter trellis. These natural Willow garden trellis available in four sizes. Framed Willow Trellis Panel - 1.2m. Trellis panels measures: 1.2m (4ft) x 0.45m (1' 6"). Made from natural willow this trellis fencing is easy to use and is of sturdy construction. This garden trellis is ideal for use with garden flower planters. Create an instant feature with this decorative trellis. Look at other garden trellis that is available, wooden trellis, trellis fencing and metal trellis. Framed Willow Trellis Panel - 1.8m. Trellis panels measures: 1.8m (6ft) x 0.6m (2ft). Look at other garden trellis that is available, wooden trellis, trellis fencing and metal trellis.en trellis, trellis fencing and metal trellis. This fixed trellis panel is made from 30mm x 15mm section. Flower trellis has square mesh and strong wood sections. Ideally to be used as wooden wall trellis. Suitable for many varieties of climbing plants. Other varieties of trellis available in our range includes metal trellis, wooden trellis and riveted trellis. Wall trellis made from 30mm x 15mm section. Wooden trellis ideal for many climbing plants. Look at other trellis is our range, metal trellis, riveted trellis, wooden trellis and willow trellis.